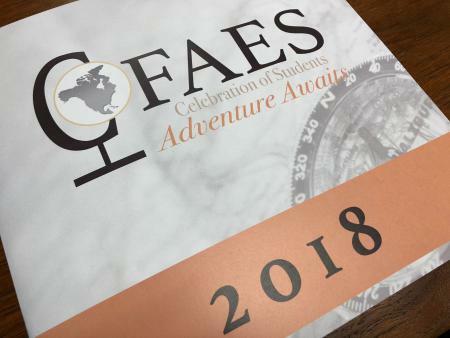 On April 12th, the College of Food, Agricultural, and Environmental Sciences (CFAES) came together to celebrate its exceptional students and the faculty, staff, and alumni who help support them. In addition to Department of Food, Agricultural and Biological Engineering (FABE) Lecturer Dr. Dewey Mann receiving the Outstanding Academic Mentor Award, three FABE students were also recognized. Holly Huellemeier, FABE major with a specialization in food engineering, was recognized as one of 20 Outstanding Seniors. Holly is pursuing a combined BS and MS degree from FABE and is involved in the department as a Graduate Teaching Associate for the Fluid Mechanics and Heat and Mass Transfer courses. Tanner Matthews, Agricultural Systems Management (ASM) major, was named one of the five rank two Newcomb Scholars. The Newcomb Scholar Award is presented to five students in each rank that hold the highest cumulative GPAs in the entire college. Matthew Klopfenstein, FABE major with a specialization in agricultural engineering, received the CFAES Internship Award in FABE for his work as a Product Evaluation Engineer Co-Op for Kuhn North America. The CFAES Internship Awards are given to one student in each department who has excelled in their internship experience.